The spotted hyenas drag away the spine and skull of an (obviously) dead wildebeest. Hyenas are known as scavengers, but are also reputed to have the most intelligence and skill when on the hunt. A common strategy is for one hyena to go in and cause confusion in the herd, and then pack members pick off the older weak herd members and chase the rest away. 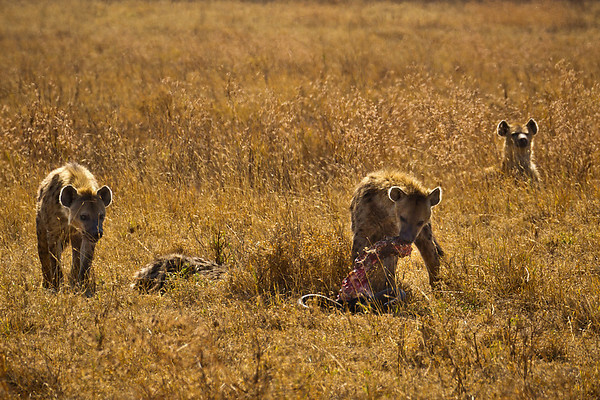 Humans and hyenas often come into contact, and the Maasai people even leave their dead to be consumed by the hyenas.